It's not uncommon for bands to go through many personnel changes in their career. 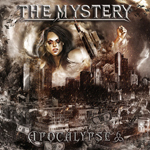 Germany's The Mystery welcomes their fifth female lead vocalist for their, appropriately enough, fifth album Apocalypse 666. Iris Boanta has good heavy metal voice, a bit raspy yet clear and strong. Apocalypse 666 finds the band in similar form. They stay their course of delivering Eighties style melodic heavy and power metal. The arrangements mostly rush along powered by a tight rhythm section, while twin guitars supply classic metal leads. The Great Escape, Ride On and the title cut are examples of speed, melody and metal working well together. With Apocalypse 666, The Mystery takes a dim view of our future, suggesting 2012 is certainly the end. It's not all speed all the time as Assaulted Minds moderates its pace. In Heaven or Hell definitely slows, and with some light piano early, nears more a metal anthem or ballad. If you dig traditional metal, both melodic and heavy, Apocalypse 666 is a superb example of the genre, and a fine return for The Mystery. Recommended. If you dig traditional metal, both melodic and heavy, Apocalypse 666 is a superb example of the genre, and a fine return for The Mystery.